Way of Shambhala is an extensive path of training in authentic meditation practices and wisdom teachings for anyone interested in pursuing such training. This program of courses and weekend retreats offers an experiential overview of practices, teachings, contemplative arts, and physical disciplines rooted in the ancient traditions of Shambhala and Vajrayana Buddhism. The program is open to people of all religious backgrounds or no religious background. It is recommended for new and experienced meditators as well as those looking to enrich their personal spiritual path and social action. We welcome you to participate to the extent you wish. Sample a course or a weekend retreat—or a number of them—at any time. The full program is described below. 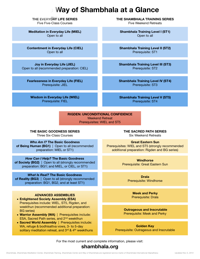 To view and download the “Way of Shambhala at a Glance” diagram shown at the right, click here. the Sacred Path series—six weekend retreats. 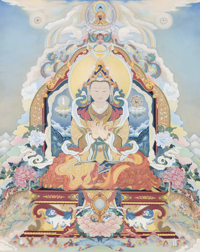 Way of Shambhala also encompasses some one- to two-week retreats and advanced assemblies. For information about those programs, and about how Way of Shambhala fits in the overall Shambhala path, please see The Shambhala Path on Shambhala's central website. The courses are interactive, communal, and create a learning environment where the teachings are intimate and relevant. Participants train in meditation, and use inquiry, dialogue, and contemplative arts to integrate the teachings. The weekend retreats are opportunities to deepen meditation practice in a powerful environment that meets the needs of a workweek and family life. You may start with any series except the Sacred Path. In each series, the courses or weekend retreats are designed to be taken sequentially. For example, Shambhala Training participants progress from Level I to Level V in sequence. The most gradual introduction is to take the Meditation in Everyday Life course first. Anyone may take either the Everyday Life courses or the Shambhala Training weekend retreats exclusively. We encourage concurrent participation in both, if possible, as the combination can profoundly deepen and extend meditation. The Basic Goodness series introduces the view of Shambhala in an experiential way. The key difference between the Everyday Life courses and the Basic Goodness courses is that the Everyday Life courses emphasize personal transformation in daily life, whereas the Basic Goodness courses emphasize the experiential study of view and meaning. While you may start with this series, we recommend the preparation outlined below. We also recommend that you complete the Basic Goodness series before attending Enlightened Society Assembly if possible. The Basic Goodness series is prerequisite for Warrior Assembly. The Sacred Path series is a sequence of advanced Shambhala Training weekend retreats based on the unique inner teachings of Shambhala. You may start the Sacred Path series anytime after completing Shambhala Training Levels I–V and the Everyday Life series. The Rigden weekend retreat and Basic Goodness series are strongly recommended additional preparation. The Sacred Path series is not prerequisite for Enlightened Society Assembly but is prerequisite for Warrior Assembly.